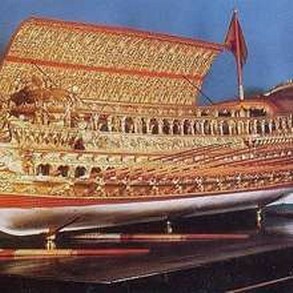 The Bucintoro was the boat parade used from the Doges of Venice Republic to celebrate the Rite of Marriage with the Sea. It was destroyed by Napoleonic army in 1798. From some years, a foundation would like to reconstruct the Bucintoro in the ancient splendor. Some parts have already been made, but the problem is that the necessary amount of money will be of about 5 million. The novelty of this year is the involvement of French President Nicolas Sarkozy, who seems convinced that if a Frenchman has destroyed the boat, a Frenchman has at least a duty to help rebuild it. The foundation is awaiting assignment of a hangar at the arsenal of Venice where to put the pieces of boat already built, pending funding.